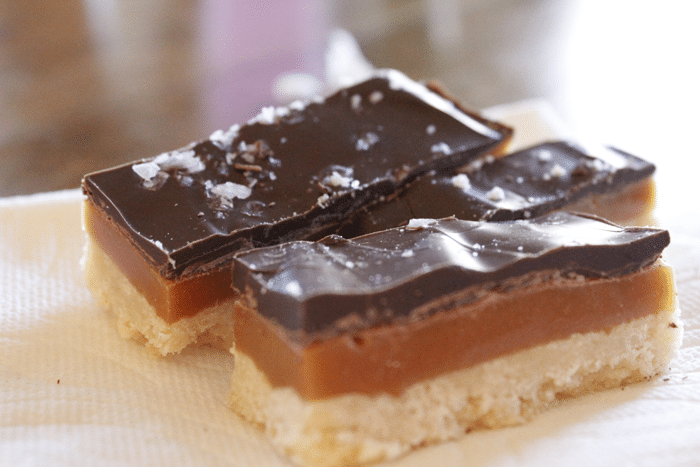 This cookie of chocolate, caramel and shortbread is irresistible! To make this even easier, I bought a 5lb block of caramel like a crazy lady. I’ll use it all this season, I’m sure. Our choice shop for so many speciality items is King Arthur Flour. 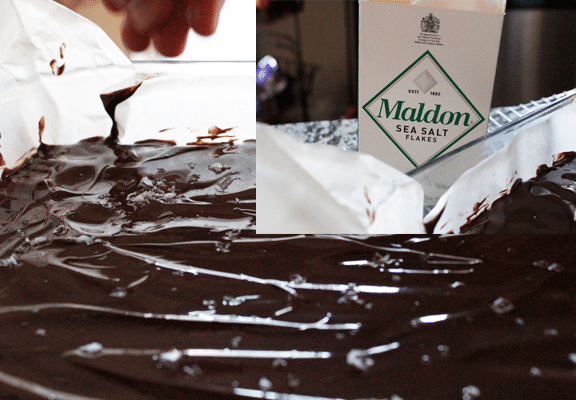 Two ingredients in this recipe, Peter’s 5lb Caramel Block, and Maldon Crystal Sea Salt, came from KAF. 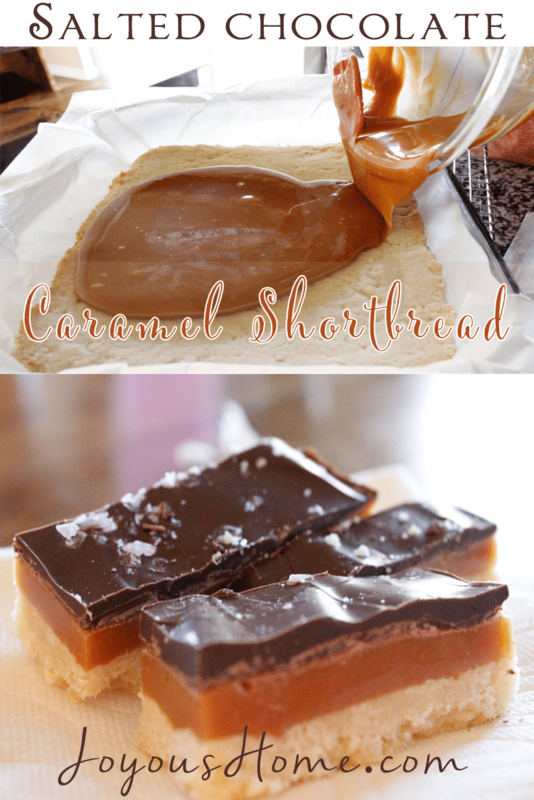 This recipe uses 1 1/2lb of caramel. 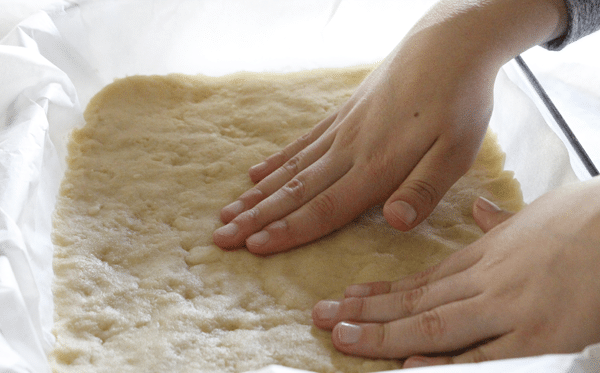 Oven 350 degrees – Prepare a 13″ x 9″ baking pan by lining it with parchment paper, a little larger so you can easily lift the shortbread out after layering and cooling. Combine flour, sugar and salt in a medium bowl. Add the melted butter and stir until the mixture is pulled together. Crumble over the pan and press evenly all around. Try to get it as even as possible. Bake for 25-30 minutes. After baking, and while warm, prick with a fork then take a metal spatula and press evenly down on the cookie crust to compress it. 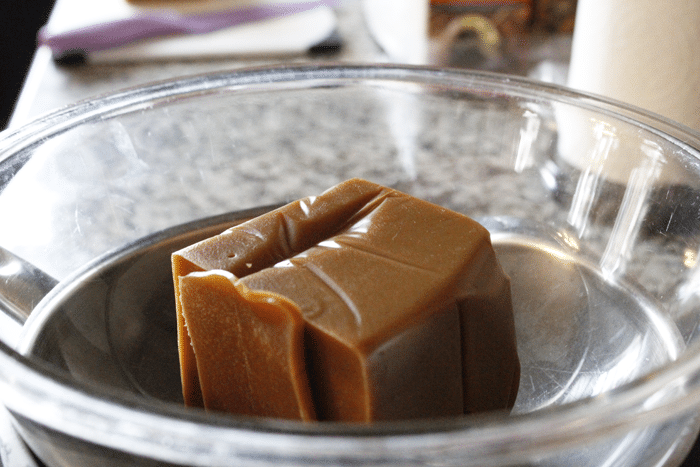 I made my own double boiler for the caramel block. 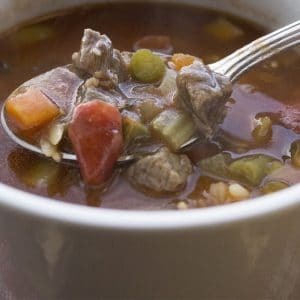 If you want to do the same, use a sauce pot filled with water, heat the water to a low boil and put a glass bowl on top. I put the 1 1/2 lbs of caramel in the glass bowl and allowed it to melt. When it’s 1/2 melted, add the cream. The cream keeps the caramel a little softer. Once melted pour on the cooled shortbread. I used a little more than 8 oz. of Ghiradelli Dark Melting Chocolate. You can use 8 oz. of any bittersweet chocolate for the top. Wash out the glass bowl. 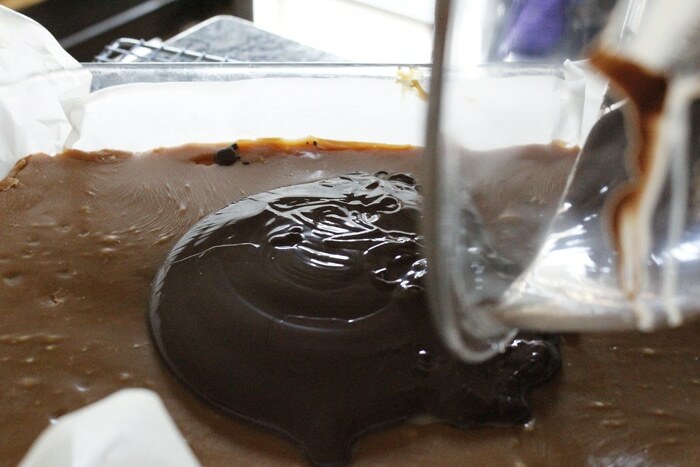 While the shortbread cools, melt your chocolate in the double boiler. I seldom use the microwave to melt chocolate for fear of burning it. 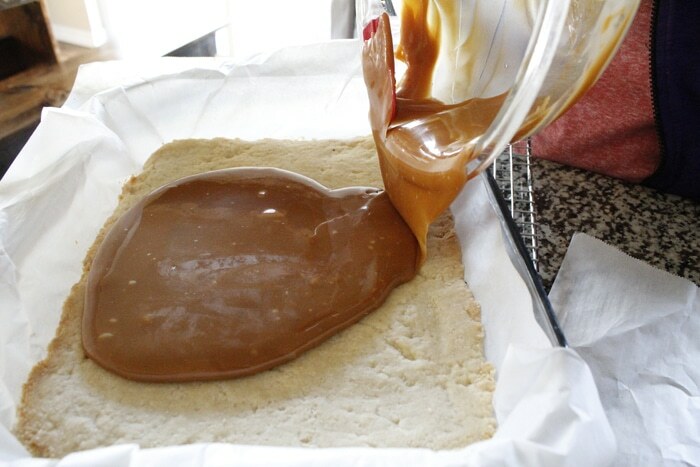 When the caramel is fairly firm, pour the chocolate on top and spread evenly. Sprinkle with sea salt flakes. 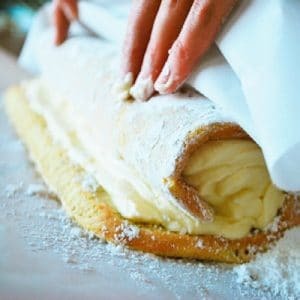 You’ll need about 2 hours to make this but the steps are SO easy and the results are delicious. It’s a great treat gift for a neighbor. Theresa has been married to John for 24 years, we have 10 children and three grandchildren. 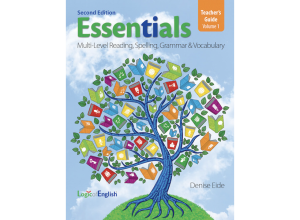 Five of our children are still being homeschooled, the youngest is in third grade. I'm a blessed child of God. I love everything about homemaking! Joyous Home was started in 2007 to encourage homemaking! Would You Like Our Newsletter? 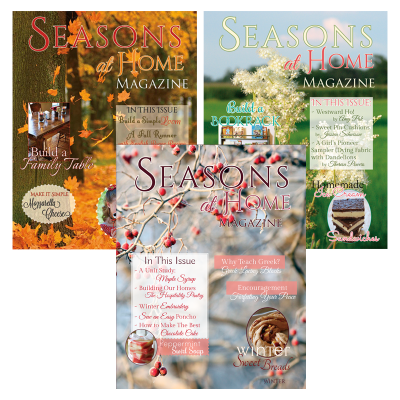 My daughter, Jessica, and I have been working on homemaking delights together since 2004. We are wives, mothers, and friends! Jessica is a mother to 3 lovely little ladies, and I’m a mother to 10. Our blog reflects everything we love about our homes. We hope you find many inspiring things during your visit! 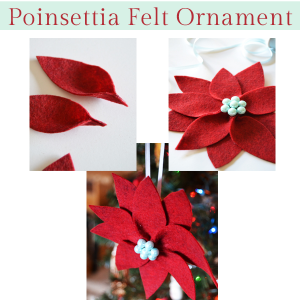 Felt Poinsettia Ornament – Easy! Make an Easy Spring Wreath| All Things Spring Link Up! 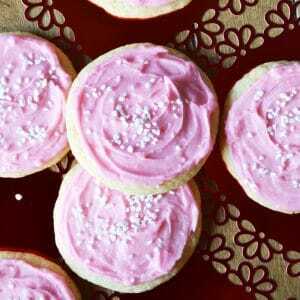 Silk Ribbon Embroidery Plus Cupcakes for Valentine’s Day! Fall! 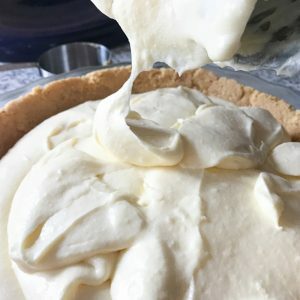 Easy Powdered Creamer and Our Best Pumpkin Cake!